Marblehead: Walt Reichner shouts down to his friends from atop Castle Rock in Marblehead. On the ground, from left, are Jo Ann Johnson, Joan Reichner, Walt's wife, and Arlene and Frank Ruisi. Walt Reichner was visiting the North Shore before his Aug. 14 performance with the Highway Poets Motorcycle Club at the White Whale on Hale Street in Beverly. Photo by Mary Catherine Adams/Salem News. 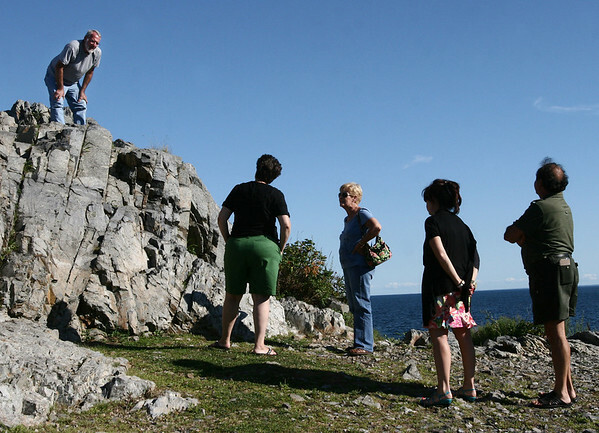 , Marblehead: Walt Reichner shouts down to his friends from atop Castle Rock in Marblehead. On the ground, from left, are Jo Ann Johnson, Joan Reichner, Walt's wife, and Arlene and Frank Ruisi. Walt Reichner was visiting the North Shore before his Aug. 14 performance with the Highway Poets Motorcycle Club at the White Whale on Hale Street in Beverly. Photo by Mary Catherine Adams/Salem News.